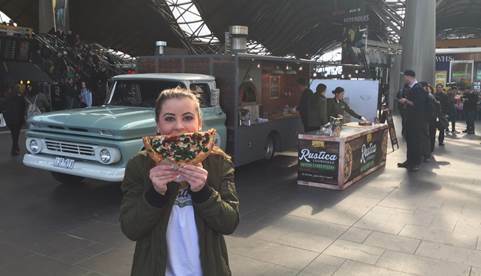 McCain Foods is taking its new Rustica pizza to the streets across Melbourne and Sydney to demonstrate that frozen pizza can taste as good as woodfired pizza. It called upon shopper engagement specialist, Extravert, to help and they sourced a 1962 Chevy Truck from the US that has been converted into a rustic pizza kitchen to bake the three types of sourdough crust pizzas. From now through to mid-October, Extravert is conducting live activations and sampling at various locations in Melbourne and Sydney: high traffic areas such as Southern Cross Station, Westfield Knox, Queensbridge, St Kilda, Federation Square, Bondi Beach, Chatswood Mall, Cronulla, Parramatta and Martin Place. Many locations have also been selected to sample new McCain Rustic chips. Extravert’s Daniel Cormack said the investment in live engagement and sampling will reach thousands of people and is a beneficial investment. “We have only completed a few locations and already we know that our brief – to demonstrate that finally, there’s now a quality woodfired pizza in the freezer – has been achieved. The public’s response has been fantastic,” Cormack added. Simone Formisano from McCain Foods said they wanted to change people’s perception of frozen pizza.